He was also seen crowdsurfing on the Parkway, singing with fans, riding a police bike, and, of course, chugging beers. Eagles center Jason Kelce before Thursday morning's parade. UPDATE: It's official. Jason Kelce is the MVP of the Eagles Super Bowl parade after delivering a speech for the ages from the Art Museum steps. Just take a look. Look, I deserve what Kelce said, I was wrong and he is right. 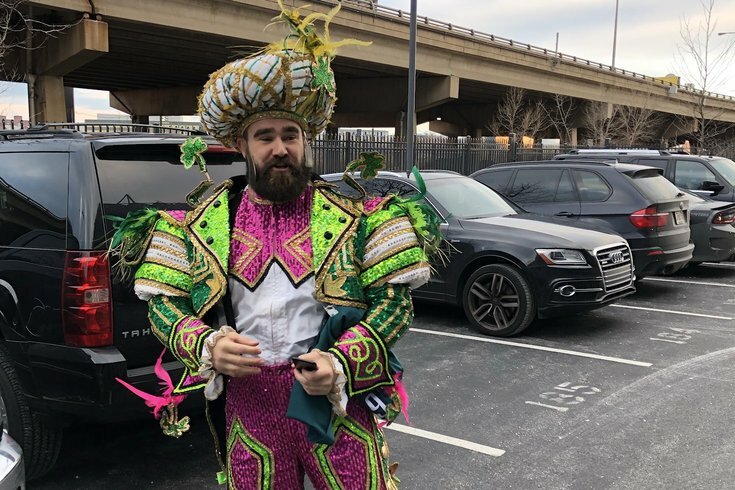 Jason Kelce is having himself quite the time at the Eagles Super Bowl parade, and rightfully so. He's hardly alone in that regard, but it's hard to argue that the Eagles center is the MVP of parade to this point. First, there's his outfit, which is a full-on Mummers costume, headgear and all. Once the parade got moving, Kelce wasted no time getting off his bus and mixing it up with the crowd, singing the unofficial Philly anthem with some Eagles fans ... and sneaking a few NSFW words onto live TV. That stock photo of the skyline really is something else. But Kelce wasn't done yet, he then hopped on a police bike and went for a little spin. Once the parade turned down the Ben Franklin Parkway and began to head to the Art Museum where Kelce would deliver a speech for the ages, he took it a step further. Kelce hopped over the barricade and into the sea of Eagles fans ... where he proceeded to crowd surf. I dare you to find me a better parade performance from a professional athlete in any city ever.